With a ruggedly beautiful coast backed by the peaks and escarpments of the Flinders Ranges, the Eyre Peninsula is definitely one of Australia’s unsung wonders. It’s a place of vivid colours, red rock landscapes and few visitors. It’s also one of the world’s best places to encounter marine life. This tour is a camping adventure. By day, you’ll be travelling and exploring, but by night you will sleep like a true Aussie bushman in swags. Relax each evening around the camp fire with a beer, swapping tales with your new travelling mates before sleeping in the peace under the dazzling stars of the southern skies, with koalas keeping you company in the surrounding trees. We travel in an air conditioned minibus, max 18 people, bush camping with no facilities or staying in simple campsites with basic facilities. This six day tour is packed with highlights. Camp in Warren Gorge in the Southern Flinders Ranges, keeping an eye out for the yellow footed rock wallabies that are ‘bouncing back’ here from near extinction. Try boarding down giant sand dunes, check out the spectacular cliffs at Locks Well and meet koalas and other native wildlife at Mikkira Station. Most activities and excursions are included in the trip price but there are a couple of optional experiences, too. You can choose to join an excursion to swim with sea lions and dolphins at Baird Bay, which costs $180 per person. This is a wonderful chance to swim with both creatures, watching how they interact with each other and you. Australian sea lions are endangered, and behave very much like puppies, playing, jumping and twirling in front of you – they might even give you a kiss! Seeing them alongside enchanting bottle nose dolphins, too, is an experience you won’t forget quickly. Anyone after an adrenaline rush can opt to go cage diving with great white sharks ($395 + $100 on board) operated by Calypso Star Charters. This takes place in Port Lincoln, the only location in Australia where you can be lowered into the sea in a cage alongside these amazing predators. It’s quite an experience – thrilling and scary! Many Nullarbor Traveller passengers over the years have stopped and immersed themselves in a real Aussie farm experience, rolled up their sleeves and done some hard yakka which is their way of giving something back to the planet. We welcome travellers who share the same philosophy to come and stay with us for a couple of night or a couple of weeks to give back to the environment and offset their own travel carbon footprint. 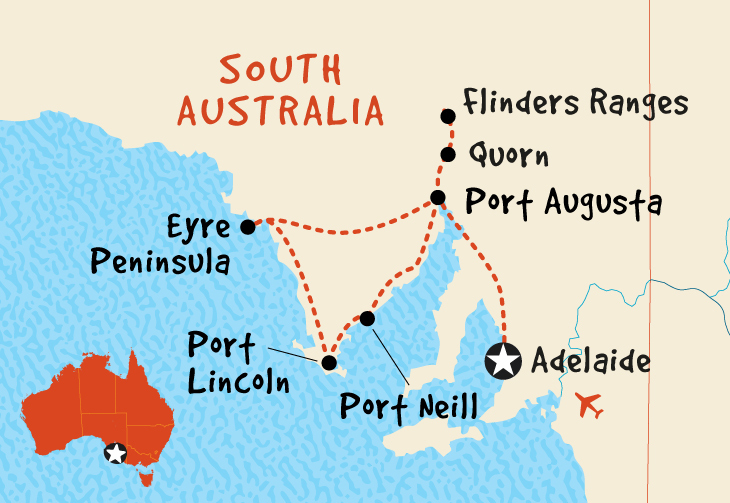 Our travellers are typically like minded – aged between 20 and 45 looking for a unique and authentic Australian experience but this trip will appeal to travellers of all ages who enjoy meeting new people as well as seeing new places. Wildlife enthusiasts can also enjoy the opportunity of whale-watching and to swim with sea lions and dolphins in a natural environment. Camp sites are always chosen to ensure little or no impact to the environment occurs. Due to the arid and isolated nature of the areas we visit an understanding of minimal water use is essential. All water is carried in and grey water carried out. We purchase reusable items (utensils and containers) and buy food in bulk with minimal packaging. All waste is carried out and disposed of in an appropriate manner. We collect and thoughtfully dispose of any rubbish sighted in the parks visited. We retain and dispose of our own rubbish in a similar manner. We minimise the use of disposable packaging and recycle all catering items where possible. Where other organizations or community groups are involved, we pay entry fees, make purchases and create economic revenue. All catering is arranged or purchased locally or home made. Our tour group sizes are limited to 21 people maximum, this size group can be managed to minimise any negative impact on the environment, the enjoyment of other people, the capacity of community services, the safety and stress of wildlife. We encourage the practice of low noise bush walking and special solo activities making our guests at one with the environment. and wasted. Sleeping arrangements were basic and used drop toilets with no electricity and little water used - so our footprint on the landscape was minimial. The tour operator and excursion operators were local so benefited from this tourism. so good in these respects. getting used to the long drives but bus was not very clean and no effort was made to keep it clean on the way - understandably the driver/guide had a lot of long hours of work and not time for cleaning on top. I took to cleaning the outside windows at fuel stations as getting opaque.